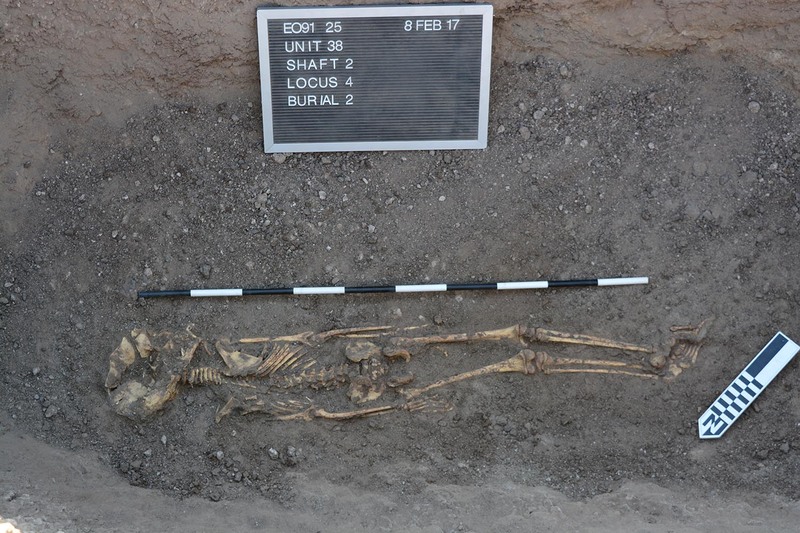 This season, small pit burials surrounding larger structures have yielded several infant and child burials. Often a young person is buried alone in a pit. In one unusual pit, we found child buried along with an elderly man. 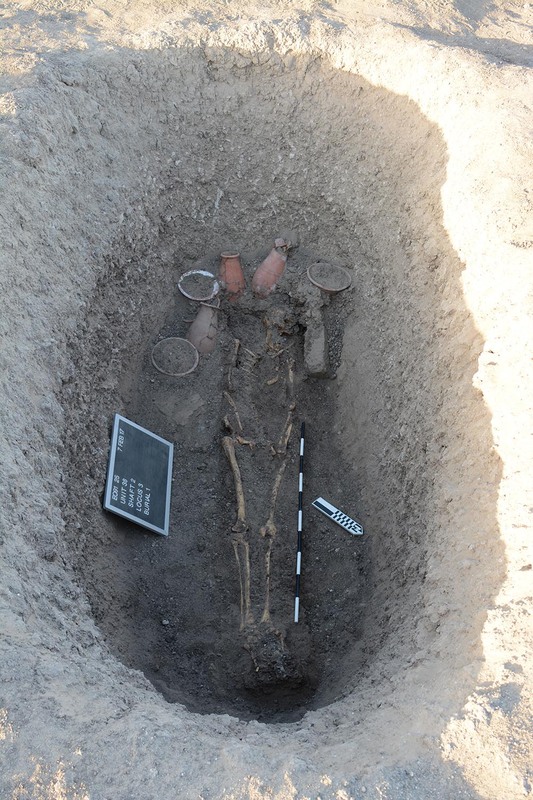 This man was buried in a wood coffin (only termite eaten frass remained) with several pottery vessels. Preliminary analysis suggests that he was on the upper end of the age spectrum (60+), very robust with large muscle attachments, tall in comparison to the rest of the sample and had healed fractures, including his left forearm, hand, and several ribs, as well as several fused vertebrae. 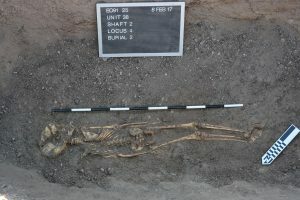 The child, approximately 12 years old, was found buried face down underneath the coffin of the elderly man; the position of the body suggests it was likely wrapped in fabric, though none was preserved. Based on previous finds at Tombos and other sites, it is possible that this child was not intentionally placed face down but that the people preparing the wrappings lost track of which side was up (see Stuart Tyson Smith’s 2003 Wretched Kush book for more info). Stuart and Michele gave a talk at the local Tombos elementary school about archaeology, our team of researchers this year, and a few of our findings. 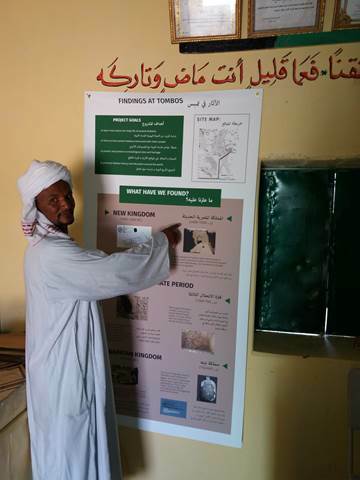 We also presented the school principal with three educational posters to assist them in teaching about archaeology, Nubian history, and our work at Tombos. We had a great discussion and enjoyed our visit. 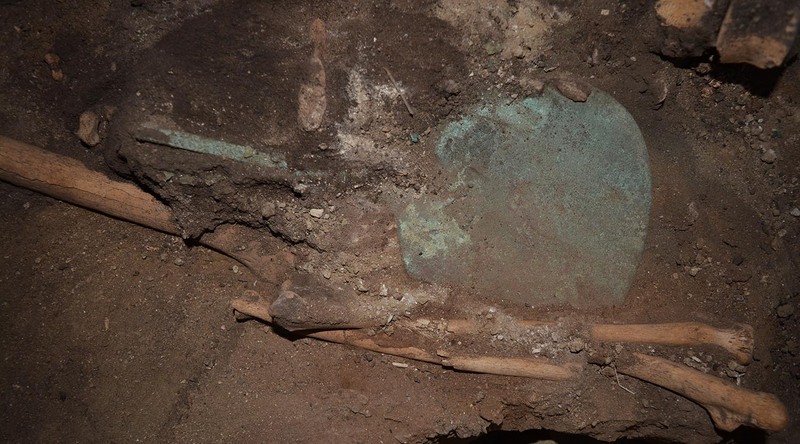 Katie Whitmore found a mirror in situ on a burial in the western chamber of a pyramid complex. A group of three burials survived intact. Each had a pair of carnelian earrings and a scarab, and this one had a copper alloy mirror and ebony khol applicator placed upon her abdomen. Mirrors were commonly included amongst the toiletries that accompanied the Egyptian dead into the Netherworld. Although both men and women wore makeup and had toiletry kits, mirrors are strongly associated with burials of women, as is the case with our example, suggesting a gendered pattern. In addition to their prosaic role, the shiny disk of a mirror symbolized the disk of the sun-god Re, and thus might have had connotations of fertility and rebirth in a funerary context. Although we are not sure if our example was decorated, mirrors often have imagery associated with the fertility goddess Hathor on the handle, reinforcing their association with the feminine and with rebirth. 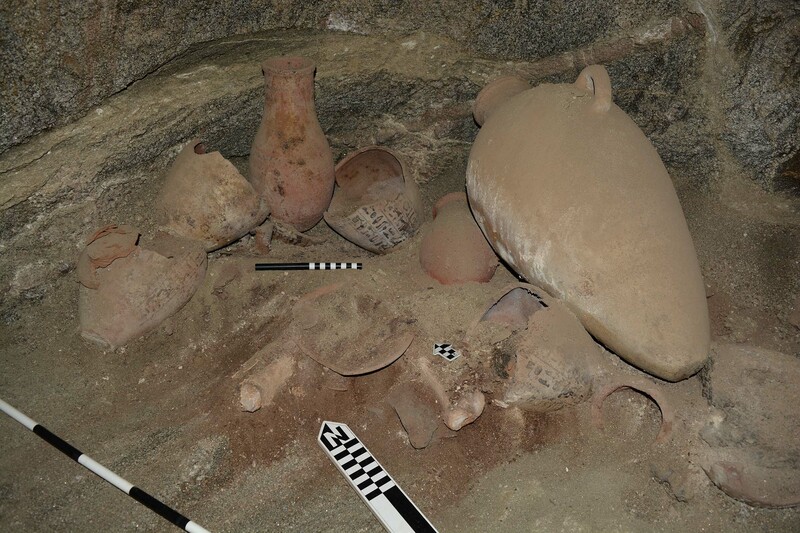 We were lucky to find a set of four inscribed ceramic canopic jars at the back of an 18th Dynasty tomb chamber, along with other pottery vessels. Ancient tomb robbers had apparently broken each in their search for valuables, but canopic jars were used to hold the separately embalmed internal organs of the deceased who had undergone the most elaborate form of mummification. The inscription on each vessel invokes the protection and blessing of one of the four Sons of Horus, Imsety for the liver, Hapy for the lungs, Duamutef for the Stomach and Kebehsenuef for the intestines. Although the practice of evisceration is often thought of as a standard part of mummification, the practice was rare in the New Kingdom, and highly correlated with the elite, although by no means ubiquitous even among them. Ceramic canopic jars were a cheaper alternative to the use of alabaster, although the appearance of canopic jars at all indicates the high status of the primary tomb owner in Tombos’ society. We also found stoppers for all of the jars decorated with human faces, as was the case for canopic jars in the New Kingdom. Later on, the stoppers assumed human and animal forms connected with the four deities—human for Imsety, baboon for Hapy, jackal for Duamutef and falcon for Kebehsenuef. Our second week of excavations has resulted in an exciting burial. 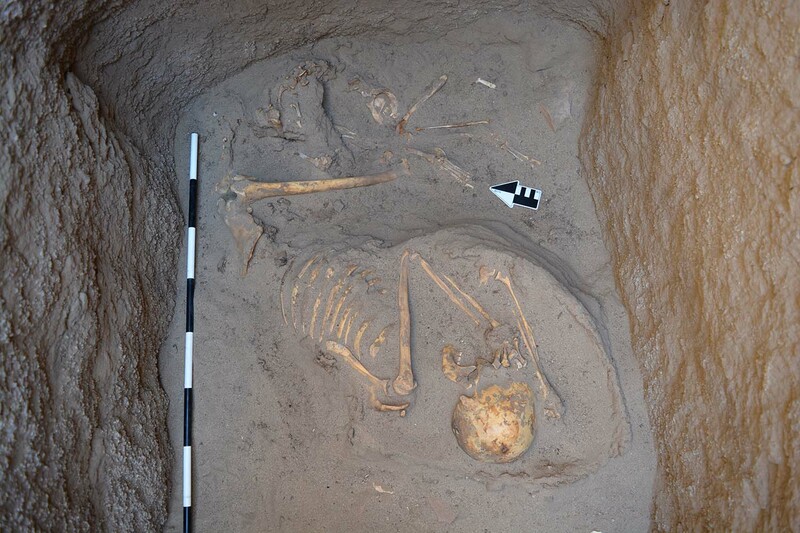 Found within a mudbrick lined burial shaft likely dating to the Third Intermediate Period is a woman buried in the Nubian flexed position on top of a large woven basket with a dog at her feet. This is our first animal burial directly associated with a person at Tombos (a horse burial was found in 2011). 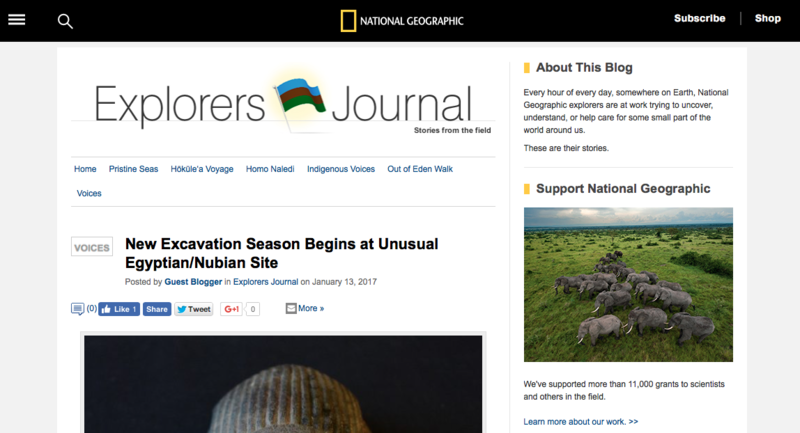 Click on the photo below to check out our article about the upcoming excavation season in National Geographic’s Explorers Journal! Gearing up for the 2017 Tombos season! 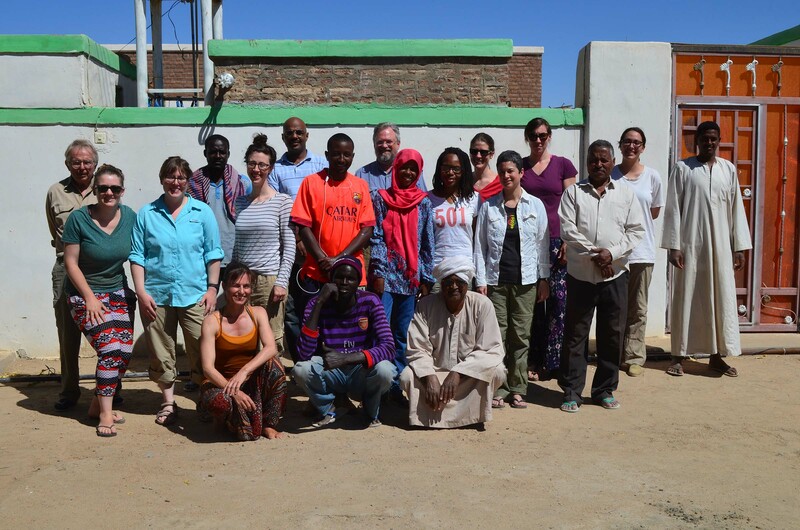 We are excitedly preparing for our next field season, which will start in about a month. We’ll be focusing on the New Kingdom Period cemetery and settlement at Tombos as well as the Kerma period cemetery at Abu Fatima. 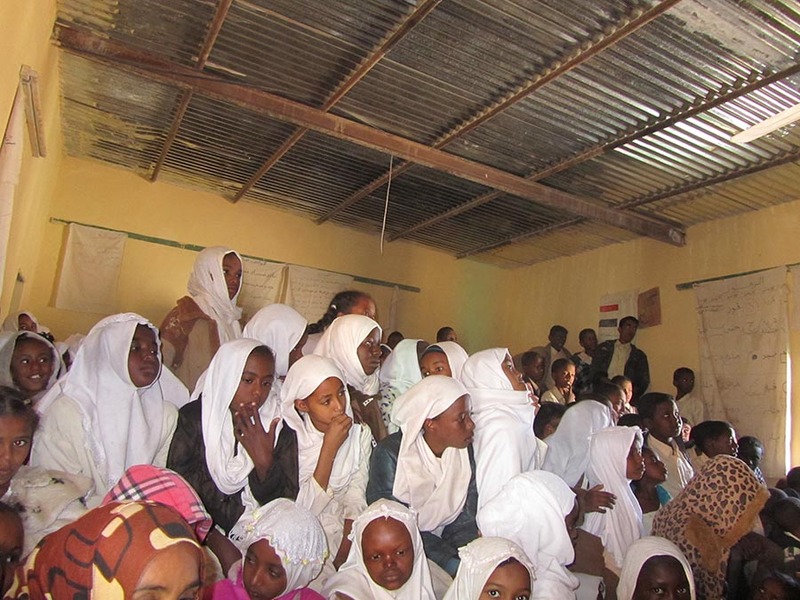 We are also continuing our local engagement with additional community and school talks and the production of educational materials for the elementary school. 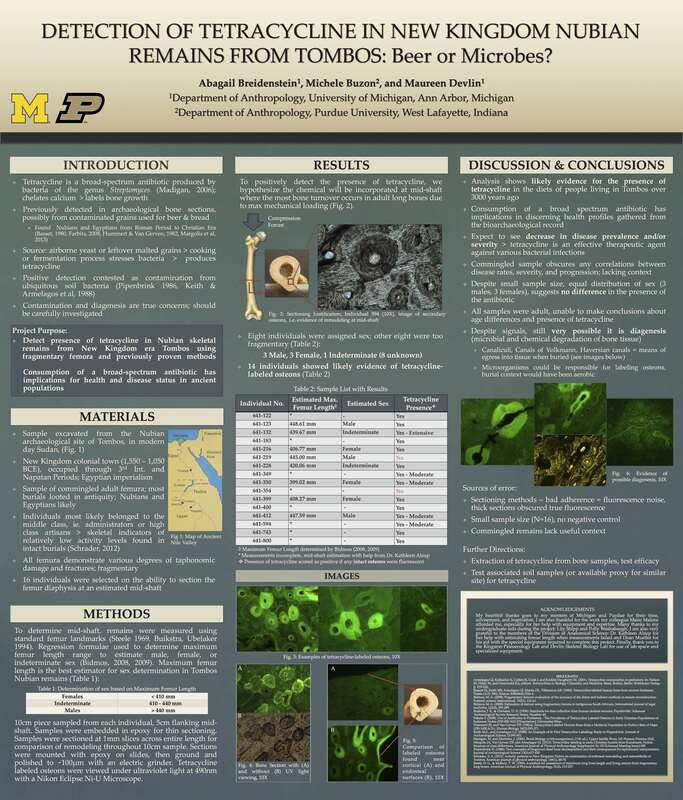 Many thanks to Purdue Undergraduate Claire Sigworth for her amazing graphic design work on the websites and materials and Dr. Mohamed Faroug Ali (UCSB PhD awarded this year!) 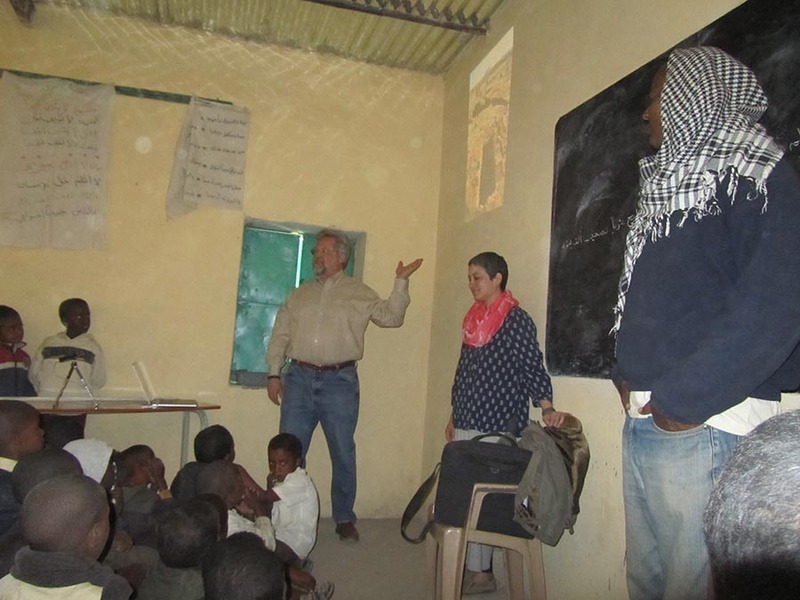 for his coordination with the community, Arabic translations, and guidance on materials. 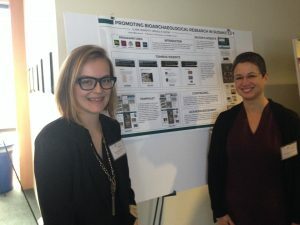 Skeletal analyses from the Tombos project were recently presented at conferences. We welcome feedback on the ongoing research. Sarah Schrader (2016). 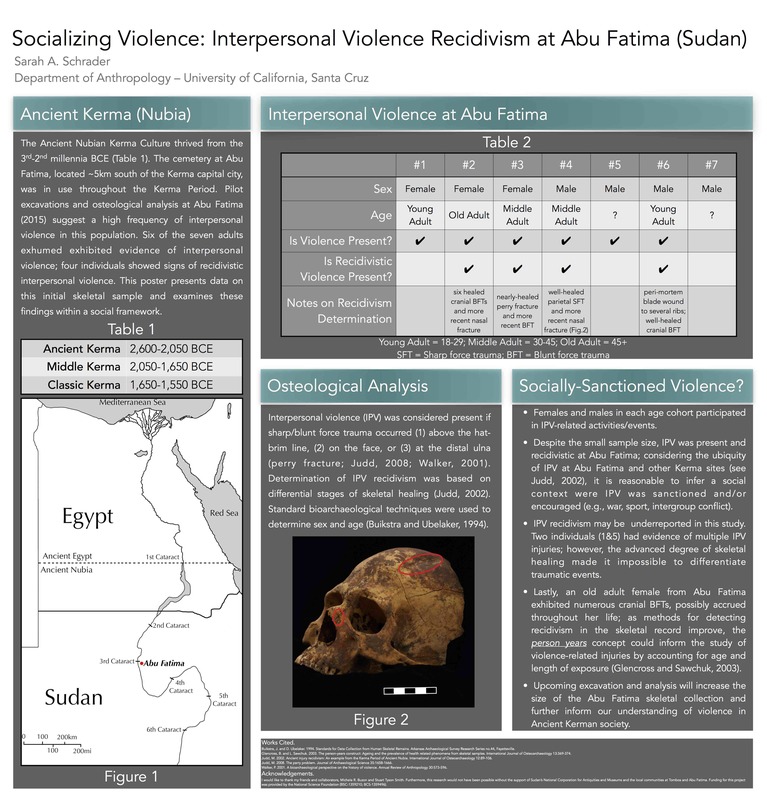 Socializing Violence: Interpersonal Violence Recidivism at Abu Fatima (Sudan). Invited Poster Symposium – Injury Recidivism and Violence: Perspectives from Bioarchaeology and Forensic Anthropology. 85th Annual Meeting of the American Association of Physical Anthropologists, Atlanta. Abagail Breidenstein, Michele Buzon & Maureen Devlin (2016). 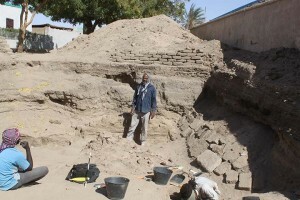 Detection of Tetracycline in New Kingdom Nubian Remains from Tombos. 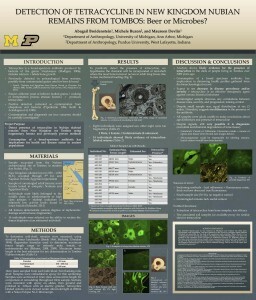 43rd Annual North American Meeting of the Paleopathology Association, Atlanta. Thanks to everyone who helped make this a great season. Stay tuned for updates as we continue analysis of the excavated materials. UCSB PhD Student Mohamed Faroug Ali has been excavating under the modern village, the site of the ancient town. He has traced a strange underground structure, following a trench cut in the alluvium approximately two meters deep, lined with mud brick walls and with a mud plaster floor. This was no simple storeroom, but a massive construction running east-west for around 100 meters. This year with the assistance of Musaab Awad Allah (Shendi Antiquities Office and University of Shendi), Mohamed found a corner, where the trench and walls make a right angle turn to the south. Large deposits of ceramics suggest a date running from the mid to late 18th Dynasty, with a final use or re-use perhaps around the time of the Amarna Period (c. 1450-1300 BC). Was this mysterious subterranean structure connected with some kind of large enclosure? If so, what was it?